It's been far too long since a young adult novel featuring zombies and high school kids came out that managed to impress me. The funny thing is... I never read the blurb for this one. I saw the title and took a glance at the cover and knew I had to give it a read. Fortunately, it proved to be one of those spontaneous book choices that pays off. Donna surprised me by being pretty cowardly through most of the book. In a genre that's full of heroines who are instantly tough and put the reigns on their fears it was actually very refreshing. She has to grow into the world she's now faced with and it's a very satisfying process. We all like to think we'd be the strong, fearless warrior in a zombie apocalypse but I think most of us would be a lot more like Donna and that makes her very relatable. The mystery of why Donna hears voices and how they help her stay safe is dragged along a bit but added another puzzle piece to try and figure out. If you hate love triangles... I didn't quite feel that DONNA OF THE DEAD had a solid one but yeah, there is a bit of that going on. I felt like it was obvious who she was going to wind up with and the other was just a distraction to bring her around to the other. The romance really wasn't what made this a great read, I felt like it was the group of teenagers thrown together and trying to stay alive using their limited resources that made it good. It was also very interesting to see an author keep certain things going that you rarely see in zombie apocalypse stories, such as cell phones and electricity, at first I was skeptical but it is well used and makes sense the way it's put together. I would definitely recommend this for the target audience but also for adults who find the premise interesting. I think there were a lot of fresh ideas done here and all the science nerdy stuff made me smile. I liked that while Kemper could have made all of the teens into cliched stereotypes she managed not to overdo them. Not sure if Kemper is planning this as a series (and I liked how it ended so I actually hope it's not) but I will definitely be keeping my eye out for future reads from her. This book is AMAZING. 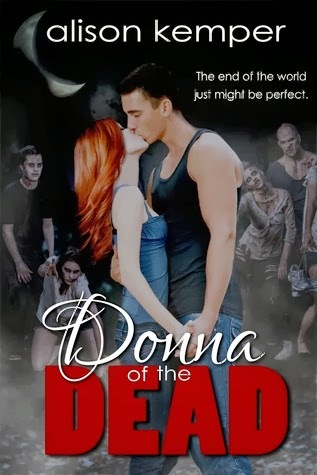 It's not your average zombie novel. (And I can say that, because I generally hate your average zombie novel.) This is laugh out loud funny and I can't wait for you guys to read it. You'd better add to your to-read lists immediately.